People love their TV. However, any TV or Cable Service will have customers that have specific needs. That’s where your call center comes in. But what call center system do you have in place? What happens if there is a major outage, and you need a stellar call center system to manage the high volume of calls? That is where Nectar Desk comes in. Keep records of all your calls. Nectar Desk’s computer telephony integration technology will give you the call monitoring and recordingyou need to keep record of your customers’ calls. All of your call detail records are available with Nectar Desk. Nectar Desk’s technology doesn’t stop there. Nectar Desk’s interactive analytics dashboard will give you insight into your call activities. Every interaction with every inbound dialer will be tracked. Nectar Desk’s Technology also extends to automating your call center processes. Its interactive voice response (IVR) and automatic call distribution features put customers in touch with the right person. Nectar Desk Technology will create an efficient call center for your TV or Cable Service company. 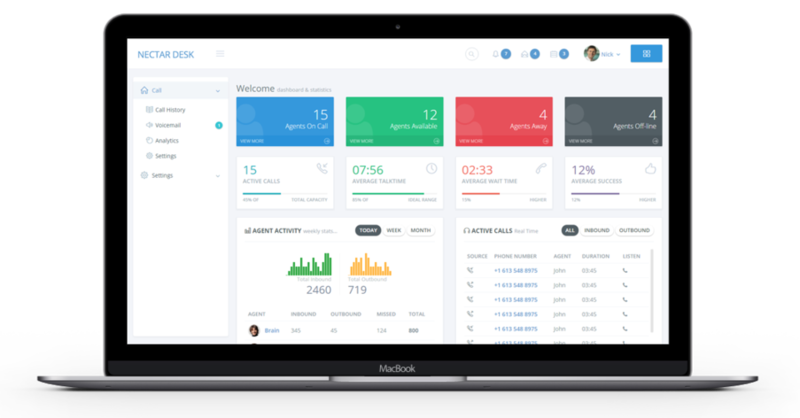 Try Nectar Desk and see your call center transform today. We offer Advanced trial accounts completely Free for 7 days.